The Titans hockey team endured a delay in league play over the past two weeks, including missing out on playing one of the top teams in the state, Valor Christian, two weeks ago. When they did finally return to the ice for games, they ended up splitting, taking down Mullen 9-0 before falling to Castle View 6-1. The loss of the Valor Christian games left a little bit of a hole in the Titans progression, but coach Joey Otsuka saw his team put together some of their best efforts during workouts leading up to this past weekend’s contests. Mullen sits at the bottom of the conference standings, so a win was expected. Yet, as is the case with several high school teams, over-confidence can be the Achilles heel and lead to lackluster play. Fortunately, over-confidence never came into play against Mullen as the Titans executed their game for three straight periods, leaving Mullen scrambling to merely stay with the Titans. The second line of Jordi Nichols, Lucas Solanik and Gage Meredith did the lion’s share of the damage through the first two periods, scoring all four goals with Nichols netting three, Solanik one and Meredith tallying two assists. “They’ve been sizzling lately,” says Otsuka. The Titans then unleashed on Mullen in the third period, scoring five unanswered goals as everyone joined in on the attack. Five different Titans scored opened by Chris Myers, Solanik scored his second of the game with Ted Trujillo, Josh Wallin and Luke Collins closing out the onslaught. The Titans then suited up Saturday, January 21 to face the Castle View Sabercats. 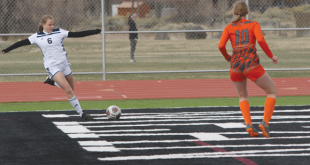 Castle View is one of the top 10 teams in the state and the Titans fell to the Sabercats 8-1 earlier in the season as they struggled with nerves and an overpowering opponent. This time around the teams went toe-to-toe for the first period and a half before things started to unravel for Crested Butte. Castle View opened the game with a long stretch of puck possession but the Titans held it off and returned the favor. Both teams traded off blows in a back-and-forth battle and the Titans missed out on a couple of great chances to score before the Sabercats closed the period with a short-handed goal. Castle View scored another short-handed goal midway through the second period and tacked on a third goal at the end of the period to go up 3-0 heading into the third period. The back breaker came in the opening minutes of the third period as Castle View scored their third short-handed goal of the game to go up 4-0. The Titans finally scored on a power-play as Nichols finished off a pass from Solanik but Castle View added two more goals in the five minutes following to skate to the 6-1 win. As the game wore down, tempers flared and several Sabercats were shown the door, including a couple being ejected from the rink. Despite the melee, the cooler heads of Crested Butte prevailed while the game disintegrated around them. “At that point I was most proud of my team,” says Otsuka. Castle View is a beatable team though, and Otsuka believes his players learned a lot from the weekend that could play out as the season continues. “I think the players learned how much they can endure and that could work to our advantage later,” says Otsuka. 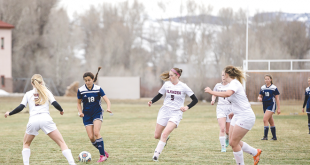 The Titans return to the road this weekend to face Mullen once again as well as Rampart, and they look to come back to Crested Butte with two wins under their belt.